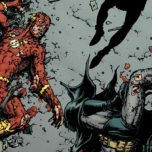 The crossover event with Batman is still weighing heavily on Barry Allen’s mind when The Flash #23 opens. Despite having seen Eobard Thawne’s death with his own eyes, he remains convinced that the Reverse Flash will find another way to come back to life like the walking paradox that he is. In addition, he also spends time trying to decipher the identity of the man in the tin helmet – the one who rescued him and Bruce from the speedforce. 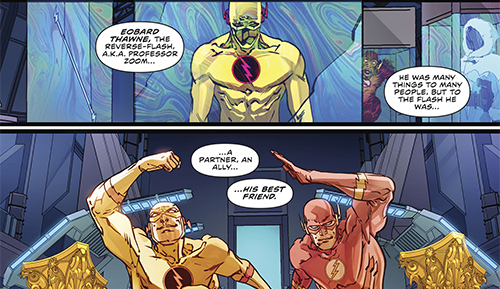 These mysteries dampen Barry’s mood considerably, and we are treated to the more somber version of him for an issue. 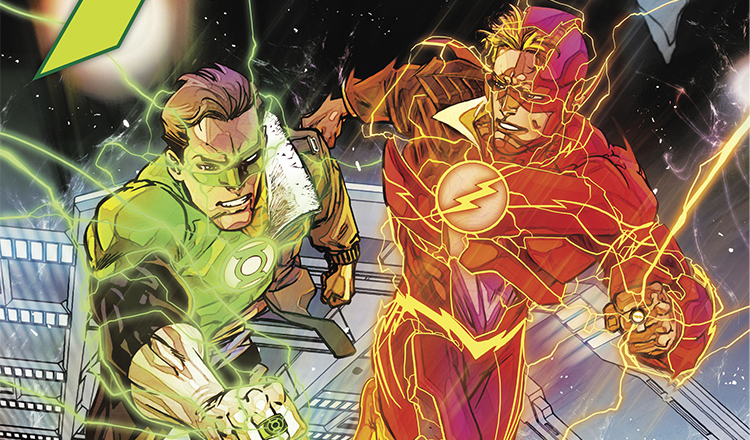 While it can be disconcerting to read The Flash when our hero is missing his signature optimism, Williamson balances Barry’s apparent introversion with none other than the exuberant Hal Jordan. 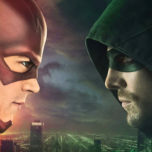 Not to mention that the push-and-pull between Barry and his loved ones creates a great juxtaposition, as Iris tries to draw him out of his shell and Wally loses patience with lies… Despite the fact that his off-putting actions are borne out of a desire to protect them instead of push them away. Hartley and Singh make a minor and very welcome appearance as well, making me hope we’ll get a few more stories that include them later down the line. Not only are they good representation for LGBTQ readers, but they’re also fun characters in their own right. 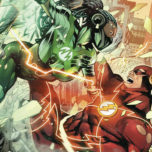 They, along with Iris, make Barry’s personal life feel fresh and vibrant – larger than simply fighting crime as the Flash. Speaking of fun characters, Hal praying for an alien invasion while Iris chews Barry out for his distance was a truly laugh-out-loud moment. 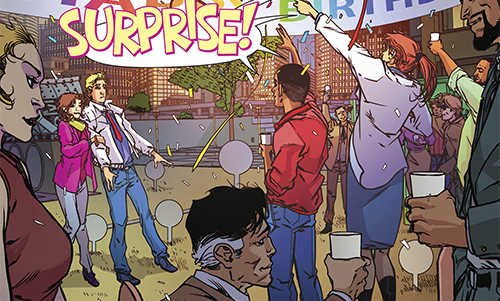 Of course, the party shenanigans and personal reunions or confrontations are quickly interrupted by the metahuman of the week. Multiplex isn’t a particularly compelling villain in this issue, but he doesn’t need to be. He serves his purpose by setting up a Green Lantern and the Flash team-up, and additionally provides some incisive commentary on men who can’t take no for an answer. 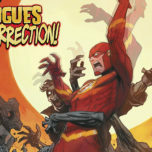 The art this issue is back to feeling like The Flash, as Carmine Di Giandomenico and Ivan Plascencia rejoin with letterer Steve Wands to create what is currently the hero’s signature look. If there’s anything missing, perhaps it’s the fact that there isn’t as much of a sense of motion this week as there has been in the past. 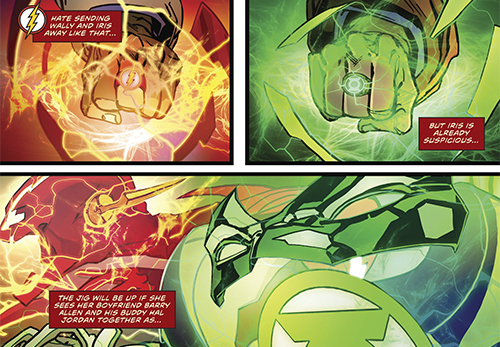 Regardless, seeing the Flash red and Lantern green colliding and converging really stood out thanks to Plascencia’s vibrant colors. The Flash loves to deal in irony, so it’s no surprise that Barry worries about Thawne attacking Iris and Wally leads to nothing less than the final splash page in the West living room. The scene remained shocking despite being telegraphed from the start, which is another testament to Williamson’s narrative craft. The opening narration calls into question what Thawne’s motives might be, and leaves readers wondering what’s different this time. Barry fears Thawne killing Iris, for example, which is something that actually happened even if Barry can’t remember it. And yet, would a man who’s trying to kill Iris receive such a glowing description at the Flash museum? Verdict: 4 out 5 stars. 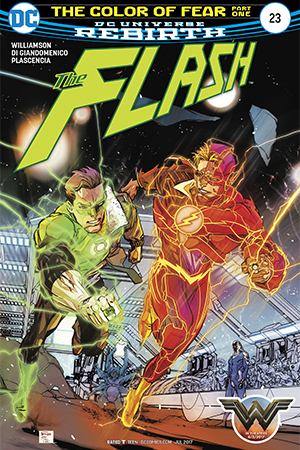 The plot is slow-moving despite The Flash‘s usual need for speed, but it’s the perfect pace for an introductory issue to a larger arc. The in-depth exploration of Barry’s mindset sets the scene for another confrontation with Reverse Flash, and the appearance of characters like Hal and Singh provide a lot of color commentary during the issue.